Delve into the lives of Dublin’s authors and poets as you view their correspondence, walk in their footsteps and even tip a pint at their favorite pubs. Attend a performance at the Abbey Theatre, Ireland’s national theater, where many of the city’s great playwrights had their works staged. 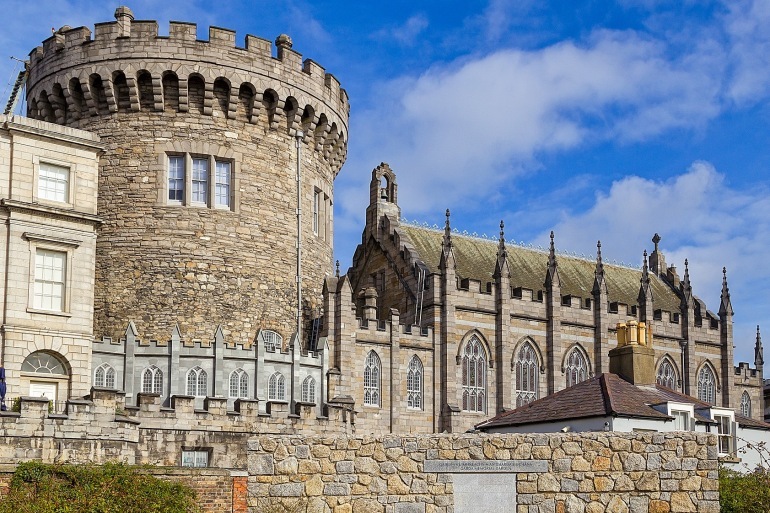 Discover Dublin’s great cultural landmarks including Christ Church Cathedral, Dublin Castle and Glasnevin Cemetery. Swift, Wilde, Shaw, Yeats, Joyce, Beckett — this town is big enough for all of them. Dublin can lay claim to some of the greatest titans of literature, not to mention great actors, musicians and artists. Hear the stories of this culturally rich city while experiencing the forward-looking energy of today. Tap your feet to the music, learn about the turbulent history and absorb the matchless culture of Dublin. Lunch: A light lunch is served in the hotel. Afternoon: After taking time to unpack, freshen up and relax you will begin your learning adventure with a coach journey around the centre of Dublin to see its historic, cultural and architectural highlights. Your instructor will bring you up to speed on the fascinating history of this ancient city. This will be followed by an orientation meeting in the hotel. You Group Leader will lead introductions, review the programme theme, the up-to-date Daily Schedule and any changes, discuss safety guidelines, emergency procedures and answer any questions you may have. Indicated times are approximate and programme activities, schedules and personnel may need to change due to local circumstances. In the event of any changes, we will alert you as quickly as possible. Thank you for your understanding. Dinner: Dinner will be served in the hotel dining room. Evening: At leisure. Continue getting to know your fellow participants, settle in, and get a good night’s sleep for the day ahead. Activity note: National Gallery: Step free access, elevators and seating throughout. National Museum of Ireland: Ramped access, access to second floor by stairs only. There is no seating, but stools are available. Participants will be able to see the museum at their own pace. Dail Eireann: Fully accessible, but there is no seating. Participants will be required to stand for 5 minutes at a time during their visit. Abbey Theatre: Step free access, two flights of stairs down to auditorium. Elevators available. Breakfast: A Full Irish Breakfast is available in the hotel. A Full Irish Breakfast traditionally contains bacon, sausages, eggs, fried tomato and toast. Breakfast will be buffet style, with breads, cereals, yoghurts, fruits and cheeses also available. Morning: This morning, we will begin by visiting the National Gallery of Ireland. The National Gallery is Ireland’s main art gallery with an impressive range of masterpieces by artists from the major European schools of art, whilst also featuring the world’s most comprehensive collection of Irish art. Following the National Gallery, we will then visit the Dail Eireann – Leinster House - the House of Representatives and principal chamber of the Irish Parliament - where you will enjoy a fascinating insight into the workings of a modern, independent European country. Lunch: Lunch this afternoon is excluded from the programme cost and is at leisure for you to discover one of Dublin’s many fine eateries. Your Group Leader will be happy to offer suggestions and give directions. Afternoon: We will then travel onwards to the National Museum of Ireland, which hosts a collection of four million objects and specimens from all over the world – with a specific focus on the history of Ireland. Expect to see silver, ceramics and glassware as well examples of folk life and costume, money and weapons. The Archaeology section has fascinating displays on Prehistoric Ireland, including early work in gold, church treasures and Viking artefacts. Dinner: Dinner will be served in the hotel. Evening: Soak up some Irish culture as we take in a performance at the Abbey Theatre, the National Theatre of Ireland. First opened in 1904 to promote Irish culture and plays, it is now a leading player in international theatre whilst still staying true to its original vision. Activity note: There are 6 steps to navigate for access to Dublin Writer’s Museum, and 25 steps to reach the first floor. Tour is audio guided so participants can go at their own pace, there is plentiful seating throughout. The Hugh Lane Gallery is fully accessible and has a lift to all floors. The James Joyce Centre is accessible from ground level, but has a flight of stairs to upper floors. The majority of the information is given whilst participants are seated. Morning: This morning we will make our way to the Dublin Writer’s Museum where a literary expert will lecture on “An Introduction To Ireland’s Literary History”. Following the lecture we’ll have time to explore the museum’s exhibitions, displays and activities, showing Irish literature as a whole as well as the lives and works of individual Irish writers. Lunch: Lunch will be included at the Hugh Lane Gallery. Afternoon: This afternoon we visit the Dublin City Gallery at Hugh Lane. Notable for its collections of fine French art, as well as classic and contemporary Irish works, the gallery is the perfect place to get lost in some truly beautiful works. We will then delve into the life of one of Dublin’s foremost writers, James Joyce, with a visit to the James Joyce Centre. Learn of his life and works and discover why he is so important to the history of Irish literature. Dinner: Dinner this evening is excluded for you to pursue your own tastes and interests. Don’t forget to sample a pint of Ireland’s favourite drink – Guinness! It’s said to taste better in Dublin than anywhere in the world. Activity note: The Book of Kells is fully accessible. Christ Church Cathedral has 2 steps to its entrance and 15 steps into the Crypt. There is a separate access to the Crypt for those who struggle with stairs. The tour begins with a 10 minute lecture, before stopping for 1 – 2 minutes at a time at various points. Plentiful seating throughout. Morning: This morning is free for you to pursue your own interests in the lively, cosmopolitan city of Dublin. Your Group Leader will be happy to offer suggestions and give directions. Lunch: We will meet for lunch at a local venue, accompanied by a relaxed lunchtime storytelling performance, giving you a taste of the classic wit and charm of Irish writing. Afternoon: This afternoon we will visit the Book of Kells is one of the most important works of religious literature still extant today. A lavish illuminated manuscript, the Book of Kells is at its heart a Bible, but also serves as a magnificent work of art. We’ll be lucky enough to view the book in person at Dublin’s National Library at Trinity College. We will then be able to visit the ecclesiastical centre of Dublin, Christ Church Cathedral. A place of worship for over 1,000 years, the Cathedral’s awe-inspiring interior and fascinating medieval crypt will be yours to explore at your leisure. Dinner: Enjoy a pre-theatre dinner at a local restaurant. Evening: Take in a performance at one of Dublin's many fine theatres. Activity note: Glendalough Monastery’s Visitor Centre is fully accessible, although due to the ancient nature of the site some parts will require walking on uneven terrain and may present difficulty to wheelchair users. Russborough House has elevator access to all but one floor, to which there is a short flight of stairs. There will be some standing required on the guided tour, however participants are able to use portable chairs. Morning: We depart for a expert-led field trip to the early Christian monastic site at Glendalough. The monastery was founded by St. Kevin, a hermit monk who died around 618 AD, and the extensive ruins include several early churches, a graceful round tower and various places of interest associated with the life of St. Kevin and early Christianity in Ireland. Lunch: Lunch will be taken at the Glendalough Hotel. Afternoon: The Field Trip continues to Russborough House. Built between 1741 and 1750, Russborough is regarded as one of Ireland’s most beautiful houses, with magnificent views of the Blessington Lakes and Wicklow Mountains. The house, which is beautifully maintained and lavishly furnished, contains fine furniture, tapestries, carpets, porcelain, silver and much of the Beit collection of paintings. Dinner: Dinner is excluded this evening. Activity note: Glasnevin Cemetery Visitor’s Centre is fully accessible, however there will be some walking on uneven terrain in the cemetery itself. The walking tour can be tailored to any mobility issues. The Gate Theatre has 6 steps on entrance and 15 steps down the auditorium, however there is direct street level access to an elevator which will avoid these if necessary. The Irish House Party is fully accessible. Morning: Cast your eyes back upon the lives of Ireland’s past as you visit Glasnevin Cemetery, a treasure trove of information and world’s first “cemetery museum”. We’ll enjoy an experty-led history of the cemetery and the graves of some of its most famous Irish residents. Following your discoveries, embark on a literary pub tour with Joycean scholar Mark Quinn. You’ll see the places where famous writers met, shared ideas and let their creative juices flow. Lunch: Lunch today is excluded. Afternoon: This afternoon is free to explore Dublin at your own pace. Your Group Leader will be happy to offer suggestions and advise you on the best way to see everything you wish. Dinner: This evening we’ll head out for a special dinner and a traditional Irish house party. A 3 course dinner with a choice of menu awaits. Evening: Enhance your Irish experience with something the country does best: fun! Enjoy a live band playing traditional Irish tunes and marvel as you witness Irish dancing at its very best, performed by All Ireland champion musicians and dancers. Activity note: The Irish Film Institute is fully accessible and has elevators to all floors. Dublin Castle has no steps to entrance but will require walking on uneven surfaces. There are benches and chairs towards the end of the tour. There are two flights of stairs to navigate should you wish to visit the chapel. The Chester Beatty library has elevators to all floors, there are also portable chairs for participants. Morning: This morning we wend our way to the Irish Film Institute, located in the heart of Dublin’s famed Temple Bar. A local expert will give a lecture on “A Panoramic Look At Classic & Contemporary Irish Film” before we are treated to a private screening of “Bernadette: Notes On A Political Journey”. The film is a powerful account of the political career of activist and “speechifier” Bernadette Devlin, an important figure in recent Irish history. Lunch: Lunch will be taken at or near the Irish Film Institute. Afternoon: From strikingly modern political tales to the distant past, we travel to Dublin Castle. First founded in 1204, the castle dominated the city’s skyline for a large part of its existence. From its foundation until 1922 it served as the seat of the British government in Ireland and now serves as a stark reminder of the country’s storied history. Fully immersed in history we will then travel to the Chester Beatty library, widely regarded as one of the most fascinating and expansive museums in the world. Its collections are segregated geographically and its Western Collections include a 3rd century Greek manuscript of the Gospel of Luke. Dinner: After a farewell meeting in which we’ll discuss our experiences of the programme and share our favourite memories, we’ll share one final dinner in the hotel. Evening: At leisure to prepare for tomorrow's departure. Breakfast: Buffet breakfast in the hotel, unless you need to depart earlier for travel connections. This concludes our programme. Morning: Complimentary transfers from the programme hotel to Dublin Airport are included and your Group Leader will inform you of arrangements. If you are staying in Dublin independently then we hope you have a wonderful time. If you are transferring to another Road Scholar programme then detailed instructions will be included in your next programme’s Information Packet. We hope you enjoy all your Road Scholar learning adventures and we look forward to having you on one of our programmes in the future. We encourage you to join our Facebook page and share photos of your programme. The Ashling is located in the heart of historic Dublin adjacent to Heuston Station, Dublin Zoo, Kilmainham Gaol and on the Luas red line.